Standard landscape composition. Lots of….well, everything. ALL REAL ESTATE IN A PHOTOGRAPH IS PRIME REAL ESTATE. Space within a composed frame must be earned. Every element that doesn’t strengthen or streamline a picture’s narrative power is detracting from it. Remembering this simple rule makes editing as easy as it is essential. It’s usually true that you add something to an image by taking something away from it. This can seem counter-intuitive when shooting landscapes, epic-sized collections of scenic…stuff, where wide-angle lenses rule the roost and it seems to just make sense to crowbar as many trees, mountains, and waves as possible into the scene, as if more will automatically be better. However, the same thing is true of vast vistas that is true of smaller ones: there are few photographs which are uniformly strong from top to bottom, end to end. You have to find the strongest core within the larger picture and pare the rest away. The tighter shot lurking within. I call attention to this because, slow learner that I am, I can often spend years coming to the conclusion that one of my pictures has been weakened or held back by a hyper-abundance of information. 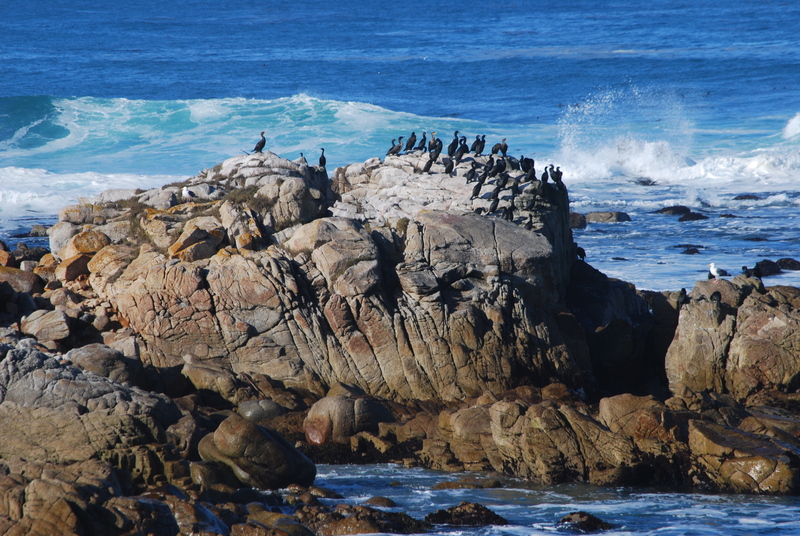 The topmost shot, an original from a 2008 trip to Carmel, California, is a case in point. None of the visual elements are particularly wrong: it’s more like they are simply too plentiful. There’s just too much sky, sea, and stone…..that is, far more than is needed to sell the story. Worse, the grouping of birds at the center of the frame, which is potentially strong enough to economically make smarter use of all those other elements, is being buried under all the surrounding… padding. The eye is being asked what to prioritize as it wanders its way through too much picture. By comparison, in the second shot, reframed as a mostly horizontal composition with the birds bumped up to prominence, the picture is now telling the eye what to see. Which only serves to illustrate that what is left out of an image is just as important as what is left in it. Just like you can muck up a story with too many plot lines, you can get in a picture’s way by making its narrative take too many detours. Say what you have to say in the cleanest way possible, and then drop the mic. This entry was posted on May 12, 2018 by Michael Perkins. It was filed under Composition, Conception, editing and was tagged with Cropping, narrative effect.